Bug Busters Pest Control Services has been serving homeowners and renters in Virginia with issues like bed bug pest control since 2005. When bed bugs invade your home, you want the problem fixed immediately. Our trained technicians understand your concerns and will eliminate the bed bugs with your family’s safety in mind, all at a competitive price. We take care to minimize the disruption to your home environment and use only environmentally responsible treatment methods. Bug Busters is one of the few companies that uses Bed Bug Detection Dogs as a bed beg pest control method to sniff out bed bug infestations. And if that isn’t cool enough, we also use Thermal Remediation to eliminate the bed bugs in your home. Spraying insecticide is a waste of time and money for bed bug pest control, and has lead to an increased amount of cases of bed bug infestations in the USA. Thermal Remediation is the best way to eliminate bed bugs the first time, saving you time and money in the long run. Bed bugs are small, flat, parasitic insects that feed solely on the blood of people and animals while they sleep. Bed bugs are reddish-brown in color, wingless, range from 1mm to 7mm (about the size of Lincoln’s head on a penny), and can live several months without a blood meal. Bed bugs are found across the globe from North and South America, to Africa, Asia and Europe. Although the presence of bed bugs has traditionally been seen as a problem in developing countries, it has recently been spreading rapidly in parts of the United States, Canada, the United Kingdom, and other parts of Europe. Bed bugs have been found in five-star hotels and resorts, although their presence is not determined by the cleanliness of the living conditions where they are found. Bed bug infestations usually occur around or near the areas where people sleep. These areas include apartments, shelters, rooming houses, hotels, cruise ships, buses, trains, and dorm rooms. They hide during the day in places such as seams of mattresses, box springs, bed frames, headboards, dresser tables, inside cracks or crevices, behind wallpaper, or any other clutter or objects around a bed. Bed bugs have been shown to be able to travel over 100 feet in a night, but tend to live within 8 feet of where people sleep. No, not that we know of. Bed bugs are simply a nusiance pest that causes itching and loss of sleep. Excessive scratching can increase the chance of a secondary skin infection though. A bed bug bite looks similar to that of a mosquito or a flea — a slightly swollen and red area that may itch and be irritating. The bite marks may be random or appear in a straight line. Other symptoms of bed bug bites include insomnia, anxiety, and skin problems that arise from profuse scratching of the bites. Because bed bugs have slim flat bodies, they are experts at hiding. They can fit into the smallest of spaces and stay there for long periods of time, even without a blood meal. Bed bugs are usually transported from place to place as people travel. They can travel in the seams and folds of luggage, overnight bags, folded clothes, bedding, furniture, and anywhere else they can hide. People do not realize they are carrying bed bugs everywhere they travel, infecting each location, and eventally their home. 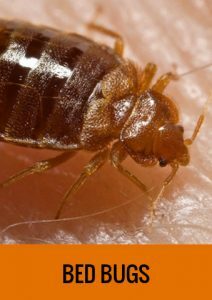 Bed bug bites usually do not pose a serious medical threat, if you do not scratch the bite. The best way to treat a bite is to (1) avoid scratching the area and (2) apply antiseptic creams or lotions and (3) take an antihistamine. Bed bug infestations are commonly treated by insecticide spraying. This is why the problem is so big. Insecticide aren’t effective because bed bugs are too sneaky and it is imppossible to find all their hiding spots. At Bug Busters, we use a bed bug pest control technique called Thermal Remediation. This method uses high levels of heat inside your home, so the bed bugs dry out and die, no matter where they are hiding.